For more information on the products and services we offer, please contact us, and we'll be happy to answer any questions you may have. 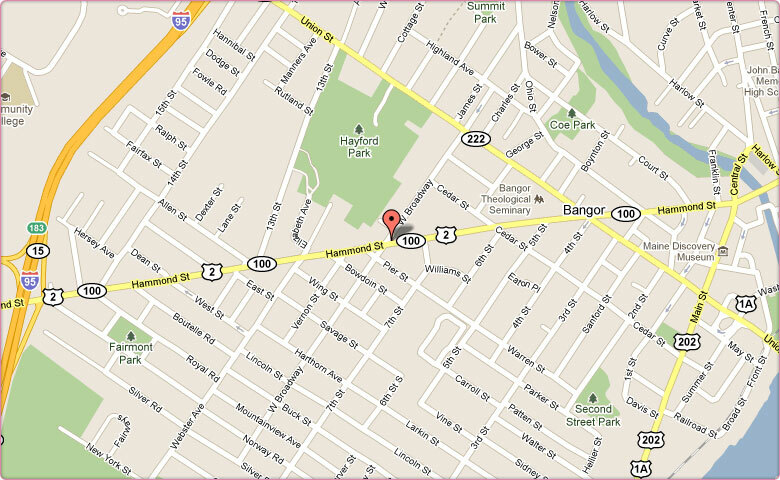 We are nestled right on the corner of Hammond Street and West Broadway in Bangor, Maine. Please use the directions and map below to find us. Take Interstate 95 to the Hammond Street exit. At the intersection make a left. Proceed east on Hammond street for about a half a mile. We are on the left, nestled on the corner of Hammond Street and West Broadway in Uptown Bangor. Take Rt 1 A West to Bangor, as you approach Midtown Brewer, stay straight at the intersection where you see Rite Aid Pharmacy to your right. Proceed through Downtown Brewer, cross the Bangor/Brewer bridge. At the second light in Bangor, turn left onto Hammond St. Proceed for a half-mile. We are on the corner of Hammond Street and West Broadway. Take Interstate 95 to the Hammond Street exit. At the intersection make a right. Proceed east on Hammond street for about a half a mile. We are on the left, nestled on the corner of Hammond Street and West Broadway in Uptown Bangor. Take Rt 222 east to Interstate 95 So. to the Hammond Street exit. At the intersection make a left. Proceed east on Hammond street for about a half a mile. We are on the left, nestled on the corner of Hammond Street and West Broadway in Uptown Bangor.